Installation numero dos. Looking for a way to burn max calories? Spinning is the solution. The hang up? An amazing soundtrack is completely necessary. The good news? Here’s another one. Check out Vol 1 right here, or just move on to the below. Put on those Nikes, grab your headband, pull a bottle of water from the refrigerator.. because after matching your pace to the songs below, you will be sweating from your eyelashes. Don’t worry.. it feels really good. We start with a little hip hop, but a song that samples from the 60s. 9th Wonder & Buckshot, “The Solution”. Warm up should be pretty quick.. little weight on the fly wheel, run (peddle fast). Good song for a climb. Stand or sit, but take the pace down. The artist is Magic Man, the song is “Paris”. Follow them on Facebook here. Slow songs are ironically great for a slow pace, or for running. Peddle double time (or close) to the beat. Or to mix it up, climb more slowly, then every 8-16 counts, sit down and sprint. Artist is Wildcat! Wildcat! (exclamation points necessary), song “Mr. Quiche”. Sprint to Joakim‘s “Lonely Hearts”. From the album “Monsters & Silly Songs”. Off the new Fitz and the Tantrum‘s album “More Than Just a Dream”, dance song ‘Out of my League’ is amazing for out-of-your-seat running. Mix it up by doing 8 counts in a standing position (back straight), then throw your rear back (over the seat, flat back) and to do 8 counts with hips behind you.. repeat. Slower run.. maybe start at a low weight on the wheel, and gradually increase it. When it becomes too heavy, stand. Match the drum beat. This is maybe one of my favorite songs ever. I don’t know if you could stay cranky listening to this. And while spinning? You’ll be too ready to puke to be cranky. Again, it’s a good thing. Presenting: White Rabbits, “Rudie Falls”.. Slow down the pace and climb. Sounds a bit like Mickey Avalon, but smarter. Doomtree, “Dots & Dashes”. Follow them and all their friends on Facebook here. Moving on to this next song, please first take a moment to appreciate that Madcon – while their interpretation was nearly identical and quite good – was not the originator of this track. Nope. Then.. go steal that mixed tape out of your mom’s Lincoln and you may just find this song. Credit where due: The Four Seasons, ‘Beggin”. But they all eventually go modern – here’s the Facebook page. Back to this century.. standing run followed by sitting sprints x 3 sounds good. Get it done with Ducky, “Your Ever After”. How this girl only has 1,100 likes on Facebook is beyond me. Help her out: Click Here. And lastly.. don’t judge.. it’s an anthem song. I don’t know about this guy – he looks like he stole Travis Barker’s tattoos and Pete Wentz’s clothes (purchased a few sizes bigger of course). But with almost a million Facebook fans, he definitely does not need my approval, and probably not yours either. If I could post the instrumental to the song I probably would because while lil’ Yela is talented, the beauty is in the music. 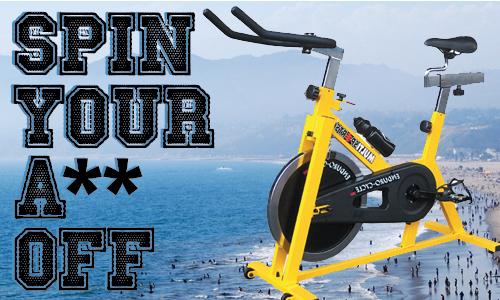 Great closer for a spin workout. Run to the beat, during the breakdown, sprint.